Every survivor knows that when facing zombies, preparation can be the difference between life and death. Be prepared! 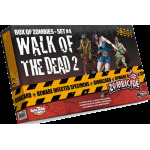 The Zombicide Storage Boxes are the perfect choice to keep your favorite Survivor ID Cards, Equipment deck, Zombie deck, dice and experience trackers all in one place and ready at a moment’s notice. Being prepared means more action! No accessories are included. Up to 50 Survivor ID Cards. Keep your entire survivor squad in one place, protected from moisture, hits and zombie bites! An Equipment deck and a Zombie deck, sleeved or not. Dice and experience trackers. More than a storage box, a real arsenal!